Impending Distractions: Flip video camera frozen - can anyone help? Flip video camera frozen - can anyone help? 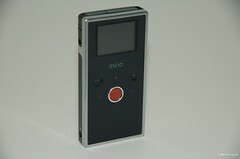 I'm having a problem with my Flip Mino video camera. While filming a clip at a concert, I pressed the red record button to stop, and the camera froze. It was stuck in the on position, with the last frame of the video I'd been shooting on the screen. I couldn't turn it off, and none of the other buttons responded, either. There were three videos on the Flip camera, including the one I'd just been recording, and I didn't want to lose any of them, so I was afraid to press the "reset" button (which is a pinhole hidden inside the tripod screw hole). My computer would not recognize the Flip camera when I plugged it into a USB port -- it didn't even register that there was something connected. My solution was to leave the camera on overnight to allow the battery to run out -- then, I thought, I might be able to get a result when plugging it into the computer. When the battery ran out, I tried again, but I got the same result. The computer does not register that the Flip Mino is plugged in. The Flip camera will not turn on now, either. Figuring there was no other option, I finally triggered the reset button, but still the camera will not turn on, nor will the computer recognize it. I'm stuck as to what to do here. The Flip Video Camcorder troubleshooting page doesn't address this problem. I use the Flip Mino a lot for work, and I'd prefer not to have to send it in for repair -- especially if there's an easy home remedy. Does anyone out there know how to fix it? I left the camera plugged into my computer for about 15 minutes this morning, and as soon as it had enough charge, it kicked back on. All videos were intact. Hopefully the drama will not repeat itself. The circus! The circus! I love the circus!